Look no further for a product that will wrap you in luxury. 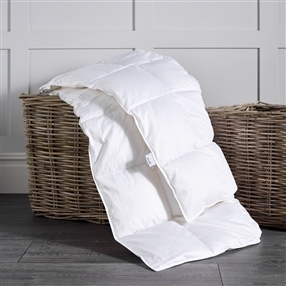 The filling is sourced from the coldest corners of Europe and boasts extra loft for a duvet that gives a warm snuggly effect thanks to the 100% pure white duck down filling. These hand filled duvets are produced to the highest quality, the 300 thread count cotton case is made with a baffle wall box construction to minimise filling movement and eliminate "cold spots".